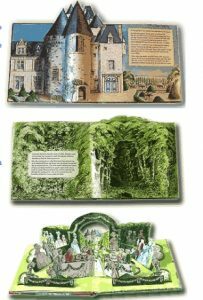 How to go about making a Pop-up Book? I must warn you that these days. new books are rarely produced by authors working in creative isolation. A more likely scenario is that the publisher has a committee of editors and sales specialists who decide what new products they would appeal to a specific market and then commissions an author and illustrator. Of course there is still room for the original idea from an individual but selling the idea to a publisher is fraught with frustration. Nevertheless, I still think the best ideas come from individuals rather than committees. So if you are trying to sell your pop-up book idea you will have to be very determined. You will think your mock-up of the idea is brilliant. The publisher and the paper engineer will think the idea is brilliant but the mechanics are rubbish. It is then up to the paper engineer to make changes to simplify and strengthen the pop-ups. The result is a consultation dummy which usually has sketches of the artwork on the pop-ups. The consultation dummy will probably go through several modifications to make it economically practical before everyone involved (including you) approves. No project can go ahead if it will end up too expensive to buy. This is a crucial stage when the skill and experience of the paper engineer is required. 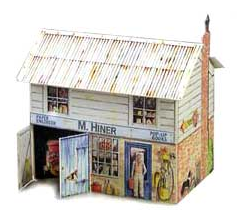 All the pop-up mechanisms have to be tailored for ease of production and the total area of the paper required to produce the book established. This process is called nesting. It is of vital importance that the area of paper fits exactly the printing processes of the printer. A blank dummy and a specification about the paper requirements are sent to the specialist printer for a quote. The paper engineer will draw up outlines for the illustrator. It is important that the illustrator stays within the outlines. It is best if the illustrator draws roughs first of all for the paper engineer to copy onto pop-up paper and assemble into a working dummy. This is to check that the illustrations will fit the mechanisms. After modifications and approval from the publisher the illustrator can go ahead with the final art work. Everything must now be prepared for film making prior to making the printing plates. First the paper engineer needs to draw up a die-line. The die-line is the cutter guide used to make the blades that will cut the printed sheets into the individual paper components. The paper engineer must then nest all the components of the book and match or register the pieces of artwork to the die-line. Care must be taken to use the grain direction of the paper to give extra strength to the components. 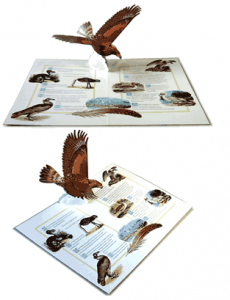 There are only a few printers who have the specialist skills to produce pop-up books. These printers are mostly situated in Thailand and China. Production begins conventionally enough with all the pieces and pages printed onto large sheets of paper. Next the sheets are transported to be die-cut. The cutters are made from large sheets of wood which have slits cut into them. Sharp metal blades are pushed onto the slits to create an exact match to the die-line originally drawn up by the paper engineer. The printed sheets are then stamped with the die cutter so all the component pieces of the book are separated. Next comes the complex task of assembly. One of the reasons it takes so long to get these books onto the shelves in the shops is the delivery time. Books are bulky items and so to be economic they are transported by sea to the receiving country’s port. This can take weeks (especially if the ship runs into bad weather) and on arrival at the port there are the usual import and customs formalities to overcome. Finally, the books are dispatched to the publisher’s warehouse before distribution to the shops (just in time for your publication date if you are lucky.